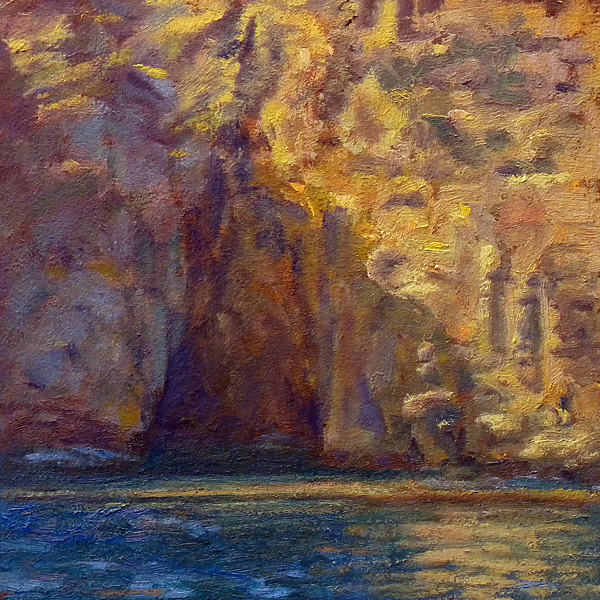 On the third morning of our Channel Islands Plein Air Painting excursion, we attempted to anchor at Santa Rosa island. Captain Jerry said that the winds and swells were not going to allow for a good safe harbor, so after a brief bit of motoring around the island, we were off to Santa Cruz Island. First stop, Painted Cave. 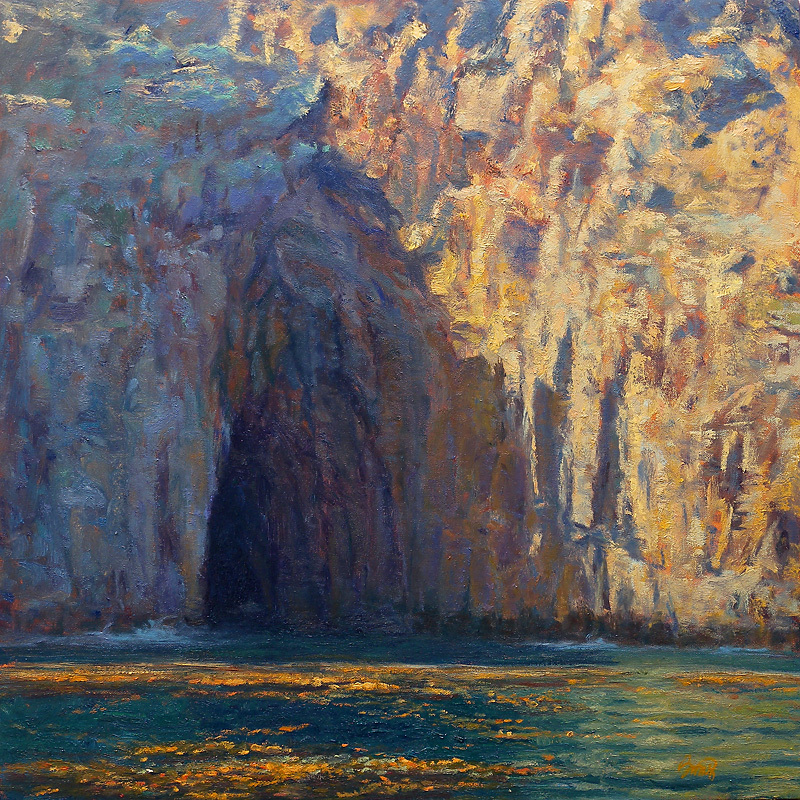 Dave Gallup was inspired to do a rendering of Painted Cave which won him California Art Club’s prestigious Gold Medal earlier this year. His painting was also featured in the current issue of American Artist Magazine. Knowing all of this, I was very much looking forward to seeing this wonder. And, a wonder it is! It is the WORLD’s largest sea cave. The Captain turned into the small nook that was hard to see if you were simply cruising past the cliffs of the island. Then we slowed down and the walls were closing in on us. He slowed down further and actually took us into the cave. All aboard were floored by his wonderful management of this vessel in some pretty tight quarters. WOW! it was beautiful. The rock walls were so many colors. We all could see why they called it “painted cave”. He went even further forward until the boat was nearly all under the outer lip of the cave. We paused there before slowly backing away. We all snapped away at the scene with our cameras, but nothing compares with actually being in front of this. Once we left Painted cave, we went into a few more spots where we could see more beautiful spots. Then to Pelican Harbor, where we came to the spot where I did a 10″ study for The Watery Cave (see left). It was a great day, and I decided at that time that I would be working this study into a larger studio painting. Well, here it is above, The Watery Cave. This painting is utterly fantastic!! Beautiful! Breathtaking! Wow, Rich… and I love your wonderful description and inspiring thoughts as well. So glad we could all share those special places together! Wow… Fantastic… I wish we could have had a ” shore sale” a few days after we got back. Great thinking ladies. I just got home and can’t wait to further develop and paint some larger from these studies. We should definitely plan a few days after trip next year. Love your warm/cool cave Rich!